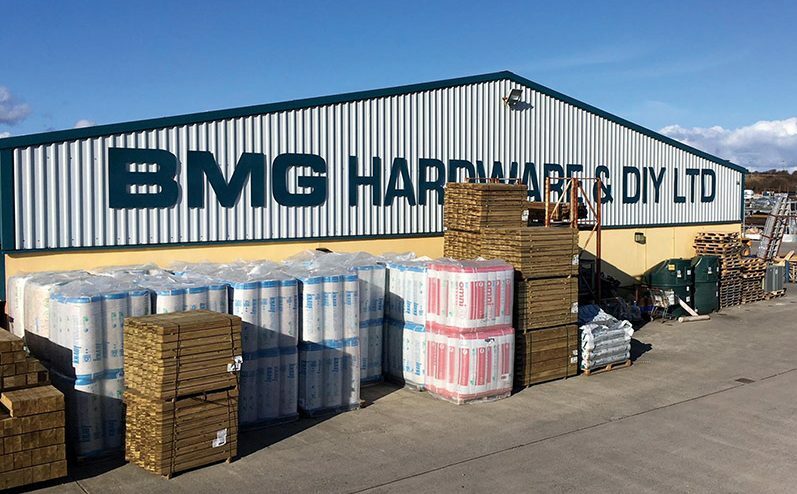 BMG Hardware & DIY in Bundoran and partner company Donegal Town Hardware provide a full range of building materials and unrivalled service levels to customers large and small across counties Donegal, Sligo, Leitrim, Fermanagh and Cavan. We had a chat with their management team to find out more about this exceptional family-run operation. Brothers Tony and Brian McGowan established BMG Hardware & DIY in beautiful Bundoran, County Donegal in 1985. Martin McGowan and John McGrory established Donegal Town Hardware in 1998. More than three decades later, the businesses continue to go from strength to strength, serving builders, contractors, home owners and DIY enthusiasts across the north west of the island and generating direct employment for 60 people. Friendly, knowledgeable, experienced and enthusiastic personnel are on hand in both stores, providing expert advice and guidance that goes above and beyond the call of duty. This willingness to create the time necessary to go the extra mile for each and every customer, coupled with an all-encompassing range of tools, building materials, steel, plumbing and heating, DIY, paints, furnishings and general hardware, – all supplied at competitive prices and delivered free of charge – makes both BMG and Donegal Town Hardware the first port of call for thousands of regular customers from across South Donegal, North Leitrim, Fermanagh, Sligo and sometimes beyond. From humble beginnings on the site of the old Marine Ballroom in the West End of Bundoran, BMG relocated to the Main Street 30 years ago before settling in its current well-appointed location in a purpose-built premises on a three-acre site outside town, just off the busy Bundoran / Ballyshannon bypass, in 2007. As for the key to the business’ success over the decades, BMG’s management team are quick to point out that the staff at BMG are the greatest asset: “The people, definitely,” they state. “We have absolutely fantastic people, some of whom have been here 30 years. We’ve brought a lot of experts into our various departments and customers trust these people and regularly ring them for advice. That’s all part of the service. Today, brothers Brian and Tony are still very much involved alongside Joseph Mc Gloin as the company’s Commercial Director and Tony’s son Bernard as Retail Shop Manager . All of them are very much hands-on, offering a personal touch and making themselves available to assist customers in any way they can. Free and fast deliveries is yet another part of their customer-driven service. BMG have three lorries on the road daily and are still providing free deliveries which it’s trade customers would value highly. With unbeatable choice, quality products, outstanding service and expert advice available, it’s little wonder that BMG Hardware & DIY and Donegal Town Hardware & DIY continue to set the pace in the north west. They’ve been at the forefront of the builders’ providers market for more than three decades and are intent on remaining there for many more years to come.